New Yorker Electronics has extended its line up of Conduction-Cooled Capacitors by offering the new Illinois HC Series of Self-Healing Polypropylene Film Conduction Cooled Resonant Capacitors with the direct mounting options. The series are compact rectangular block types, now with direct mounting options. The new 2SM6 direct-mount uses a through-hole design that is compatible with many current applications. Available in the HC1, HC2, HC3A and HC3B, the new mounting configuration offers the highest level of heat transfer and connectivity. It also removes the requirement for mounting hardware, directly mounting to bus bars. 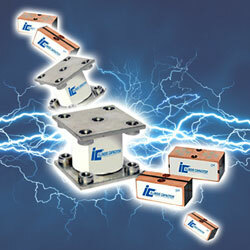 These devices are a fit for resonant power circuitry with very high current demands. They are rated at up to 1,200A RMS and 1,100VAC. Depending on the capacitance, they are compatible with resonant circuits ranging from 9kHz to 1MHz, with standard capacitance values range from 0.05µF to 37µF. Because corona can be a problem within a capacitor during high-power RF applications, the dielectrics used in both series are impregnated to stop this issue. The LC Series (LC2, LC3, LC4, LC5, LC6) capacitors have flat copper plates to allow safe handling the current and voltage in resonant power circuits. The company’s conduction cooled capacitors include a self-healing Polypropylene film construction. They are Halogen free, ROHS compliant and meet UL94V0 as flame retardant. Suitable applications include induction heating, RF amplifiers, medical imaging systems, resonant power supplies, welding equipment and electric vehicle charging stations.